Add in all the other horrors of life that can haunt us: hurricanes, assaults, rapes, car crashes, accidents, terrorist attacks... well, you can see fighting trauma is a growth market. Once, talking about vertigo and fear of heights a friend of mine said: 'I don't mind to say that I fear heights, because real men do'. 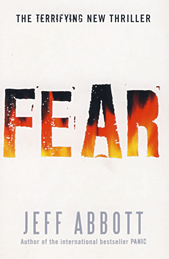 Reading 'Fear' led me to think about our fears. People we have fears always and in a wide range. Heights, darkness, solitude, loneliness, water, success... so, what's your fear? Miles Kendrick may look like a common guy walking in the streets, but what you don't know is that he uses to walk with an imaginary friend, Andy, that happens to be invisible, unnoticeable... why? well... he's dead. Miles is apparently progressing and is invited to a new program to continue with his rehabilitation. He is under witness protection by the USA government as an exchange to be jailed for murder and criminal offences. Yes, he's professional resume would be well accepted in some organizations as a high skilled mobster he may say. His psychiatrist, Allison Vance, has been killed when someone decide to make a bonfire with her office and planted a bomb in there and Miles could see the nasty boy scout who did it. A loyalty feeling will push him to find out the reason of the killing and the circumstances will put him in companion with another two PTSD patients, a self-mutilator woman and a young soldier. Given his particular background, the FBI will take him as the main suspect of the crime and will make the things a lot harder. I'll tell you why Allison was in danger if you tell me her secret. As far and deep they get into the reasons of the murder, they will find very dirty stuff related with pharmaceuticals and other sort of mobs that also make a good money without use guns... the most of times. Of course. Hospitals hate scandal. They hate dirty laundry. Keep an eye on: the three main characters who suffer PTSD, Jeff Abbott did a good research work to present us them very consistent psychologies on them. The smart way Abbott puts on the table a couple of Public Health issues: the Post Traumatic Stress Disorder (PSTD) that is a nowadays present in many countries, among others USA and UK, mostly because of all of those brave individuals who have witnessed the horrors of war; and illegal pharmaceutical research that happens to be undercover and who knows how many are victims of this everyday. This novel is an easy reading book and I would put it in my 'ideal-for-traveling-in-the-train' group. Compelling, smart, thrilling... a good work. Crazy money is still as good as sane money. Leave your comment and have your say! The name Simplyreaders, the domain simplyreaders.co.uk and all related imagery are copyrighted. The reviews are exclusive opinion of the blogger and are not related whatsoever with the writers. The books covers and quotes from the novels are shown with illustrative purposes only and are property of their authors and/or publishers. Copyright © all rights reserved 2016.